Non-MEE based High TDS RO Reject Management Zero Liquid Discharge solution developed for India’s largest customized carpet manufacturing industry. Brintons Carpet Asia Pvt Ltd. is the world’s leading designer and manufacturer of axminster carpet and boasts of some of the world’s largest commercial carpet customers. Brintons, India is undertaking complete carpet manufacturing, including designing, spinning, dyeing, weaving, finishing, latexing, quality control and dispatch. Brintons’ experience and manufacturing excellence ensures that its broadloom carpets are easy to install, offer unrivalled resistance to shading and pile reversal and are extremely hard wearing. The company has pioneered the 80/20 blend of natural wool yarn and nylon yarn that ensures all of its commercial carpets hide soil, have low flammability, and are easy to clean and have excellent color and design retention while also offering excellent resistance to abrasion. To maintain the pH at neutral. To evaporate the water and set up the plant as pretreatment to MEE for Opex reduction. To reduce the hardness from the water to increase the life of MEE. Brintons has a dye house, which uses water to dye the yarn. After dyeing this colored water is treated in an in-house ‘Effluent Treatment plant’, which removes all the harmful dyes and chemicals from the water. The outlet is good quality water which they use for gardening. The company has decided to recycle the water and decided to take in the RO system. As the RO reject is high TDS water (More than 25000 ppm) they have simultaneously started exploring the technologies for High TDS RO reject treatment. As the operating cost of MEE is very high to treat the high TDS effluent and many other difficulties in operating the MEE, they have contacted Phycolinc and we have set up the Pilot plant over there to treat the High TDS RO reject effluent. 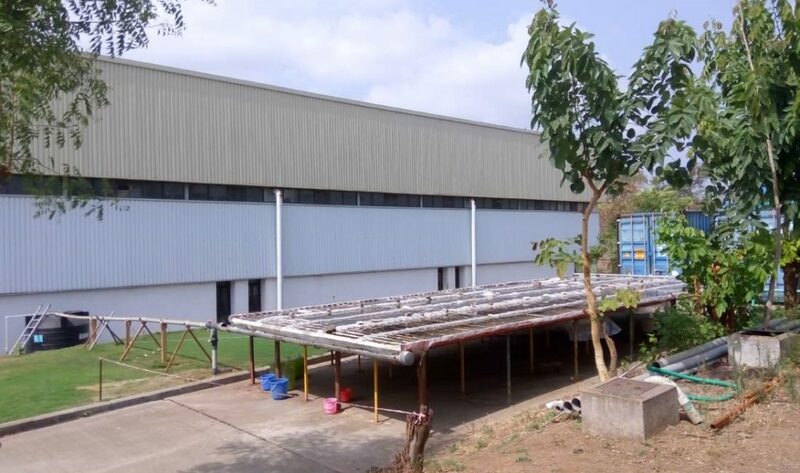 A 60 M2 corrugated cement sheet was erected and was covered by plastic sheet to prevent leakages. A tank of 5000 L was used to store the algae buffer culture. A recirculation pump of 2.5 M3/h was used to re-circulate the algal culture onto the corrugated surface. Harvesting of the algae was manual and no external harvesting mechanism was present. The TDS is accumulated in the Algae Biomass and it is reduced from the effluent in the tank. As we are not discharging any water out of the system, the TDS load should be accumulated in the tank. This is called theoretical TDS. But the actual measured TDS in the system was very low compared to theoretical TDS. Theoretical TDS based on actual TDS load is around 350000 ppm. § Chloride data is not available. Without chloride data, the average salt concentration in algae over 4 months is recorded to be 29.9%. On average, we expect the chloride concentration in algae to be around 5%, based on data we have from other sites. So the average salt concentration in algae will be around 35%.